The U.N. nuclear watchdog's board censured Iran on Friday, with 25 nations backing a resolution demanding that Tehran immediately freeze construction of its newly revealed nuclear facility and heed Security Council resolutions to stop uranium enrichment. Iran remained defiant, with its chief representative to the International Atomic Energy Agency declaring that his country would resist "pressure, resolutions, sanction(s) and threat of military attack." 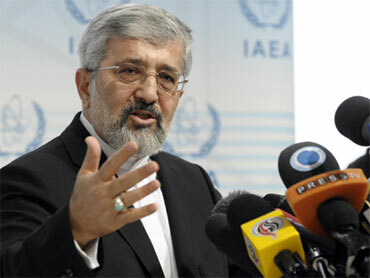 Delegate Ali Asghar Soltanieh of Iran shrugged off the vote. "Neither resolutions of the board of governors nor those of the United Nations Security Council ... neither sanctions nor the threat of military attacks can interrupt peaceful nuclear activities in Iran, even a second," he told the closed-door meeting, in remarks made available to reporters. Iran argues that its nuclear program is aimed at creating a peaceful nuclear energy network to serve its growing population. The United States and other nations believe Iran's nuclear program has the goal of creating nuclear weapons. The IAEA resolution criticized Iran for defying a U.N. Security Council ban on uranium enrichment  the source of both nuclear fuel and the fissile core of warheads. It also censured Iran for secretly building a uranium enrichment facility and demanded that it immediately suspend further construction. It noted that IAEA chief Mohamed ElBaradei cannot confirm that Tehran's nuclear program is exclusively geared toward peaceful uses, and expressed "serious concern" that Iran's stonewalling of an IAEA probe means "the possibility of military dimensions to Iran's nuclear program" cannot be excluded. British Prime Minister Gordon Brown called the resolution "the strongest and most definitive statement yet made by the countries who are very worried about nuclear ambitions on the part of Iran." Nations were "absolutely clear that Iran has misled the international community," Brown said at a Commonwealth summit in Trinidad. "(They are) sending the clearest possible signal to Iran that they should desist from their nuclear plans, that the world knows what they are doing and trying to do, and that they should accept the offers that have been made." The resolution  and the resulting vote of the IAEA's 35-nation decision-making board  were significant on several counts. The resolution was endorsed by six world powers  the U.S., Russia, China, Britain, France and Germany  reflecting a rare measure of unity on Iran. Previously, Moscow and Beijing have acted as a traditional drag on efforts to punish Iran for its nuclear defiance, either preventing new U.N. Security Council sanctions or watering down their potency. They did not formally endorse the last IAEA resolution in 2006, which referred Iran to the Security Council, starting the process that has resulted in three sets of sanctions against the Islamic Republic. Their backing for the document at the Vienna meeting thus reflected broad international disenchantment with Tehran. "Six nations ... for the first time came together ... (and) have put together this resolution we all agreed on," Glyn Davies, the chief U.S. delegate to the IAEA, told reporters. "That's a significant development." The backing of Moscow and Beijing also appeared to signal possible support for any new push for a fourth set of U.N sanctions, should Tehran continue shunning international overtures meant to reach agreements that reduce concerns about its nuclear ambitions. Brown said he thought "the next stage will have to be sanctions if Iran doesn't respond to what is a very clear vote from the world community." German Foreign Minister Guido Westerwelle said the resolution's passage shows that "the international community still wants dialogue with Iran, but time is pressing." "Our hand is still held out," he added. "I hope Iran will take it. Iran must know: our patience is not infinite." White House Press Secretary Robert Gibbs avoided mentioning sanctions  but indicated harsher measures were possible unless Iran compromised. "Our patience and that of the international community is limited, and time is running out," he said in a statement. "If Iran refuses to meet its obligations, then it will be responsible for its own growing isolation and the consequences." Strong support for the resolution at the meeting was also notable. Only three nations  Cuba, Venezuela and Malaysia  voted against the document, with six abstentions and one member absent. Even most nonaligned IAEA board members abandoned Tehran, despite their traditional backing of the Islamic Republic. The diplomats who reported the vote spoke on condition of anonymity Friday because of the sensitivity of the situation. A separate resolution  a Russian initiative to establish an international nuclear fuel bank under IAEA oversight  passed with 23 nations for, eight against, three abstentions and one nation absent. The opposed votes came from developing nations that fear such a fuel bank, meant to place uranium enrichment under international control, could impinge on their right to develop indigenous nuclear programs. In a letter to ElBaradei, Soltanieh suggested Iran could further restrict IAEA access to its nuclear activities, arguing that media leaks of confidential information posed a security threat to Iran's nuclear facilities.